Click here for a no-cost consultation with Dr. Barbat. Or, call 586-739-2155 for more information. Missing teeth can literally be life altering, but our Shelby Township dental office provides several options to restore chewing comfort and a confident smile. Dental implants are designed to be a lasting solution for missing teeth. Unlike a denture, implants are placed in the jaw bone to provide the same stable foundation that your natural teeth once had. In addition to restoring the ability to bite and chew, Dental Implants halt bone loss that occurs when tooth roots are missing in the jaw. Bone loss contributes to changes in facial appearance, such as a sunken-in appearance of the mouth, deep wrinkling around the lips, a pointed chin and corners of the mouth that turn downward even in a smile. Dr. Barbat provides all phases of Dental Implants in one location, convenient to Macomb and Oakland County, MI. Your comfort is always a priority. Dr. Barbat offers Oral Sedation for total relaxation or I.V. Sedation for those who prefer a ‘twilight sleep’ state. 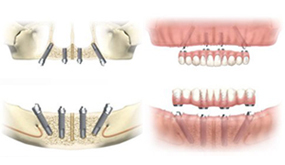 Dr. Barbat also offers the “All on 4” Dental Implant system. This is an excellent option for patients with a limited amount of bone and or limited budget. It’s a non-removable option designed to maximize the use of available bone. After All-On-4 implants are placed, a new or existing denture is attached as a temporary set of teeth so patients leave with teeth in place … ready to smile, laugh, and eat. Typically, in 3-4 months, the implants are secure and temporary teeth are replaced with a final set of teeth that are permanently attached. Other tooth replacement options are also available. are held by teeth on both sides of the area where a natural tooth or teeth are missing. After adjacent teeth are prepared for crowns, a ‘bridge’ (a replacement tooth or teeth) is affixed to the crowns, restoring appearance and chewing ability. In some instances, the bordering teeth can serve as anchors for a bridge without crowns. Instead, replacement teeth or a bridge is held by adjacent teeth with metal brackets. With the brackets attached to the back of natural teeth, they are typically not visible. fill spaces of missing teeth to give chewing ability and halt shifting of remaining teeth. Partial dentures consist of replacement teeth attached to gum-colored bases, connected by metal framework. Removable partial dentures attach to natural teeth with metal clasps or devices called precision attachments, which are not visible and more esthetic than clasps. are typically removable and replace all teeth as well as gums that have diminished in height. New denture wearers need time to get accustomed to their new “teeth” because even the best fitting denture can feel awkward at first. Some have difficulty eating for several days or weeks and may notice a slight change in facial appearance, increased salivary flow, or minor speech difficulty. These obstacles are usually overcome. Fixed bridges are held by teeth on both sides of the area where a natural tooth or teeth are missing. After adjacent teeth are prepared for crowns, a ‘bridge’ (a replacement tooth or teeth) is affixed to the crowns, restoring appearance and chewing ability. In some instances, the bordering teeth can serve as anchors for a bridge without crowns. Instead, replacement teeth or a bridge is held by adjacent teeth with metal brackets. With the brackets attached to the back of natural teeth, they are typically not visible. Partial dentures fill spaces of missing teeth to give chewing ability and halt shifting of remaining teeth. Partial dentures consist of replacement teeth attached to gum-colored bases, connected by metal framework. Removable partial dentures attach to natural teeth with metal clasps or devices called precision attachments, which are not visible and more esthetic than clasps. Full dentures are typically removable and replace all teeth as well as gums that have diminished in height. New denture wearers need time to get accustomed to their new “teeth” because even the best fitting denture can feel awkward at first. Some have difficulty eating for several days or weeks and may notice a slight change in facial appearance, increased salivary flow, or minor speech difficulty. These obstacles are usually overcome.